You can get your digital hands dirty and start shaping the surface of your Farming Simulator map using the sculpting tools in GIANTS Editor. To begin sculpting, you must enter Terrain Sculpt Mode by clicking the icon in the toolbar that looks like a pair of hills with up and down arrows above them. After you enable Terrain Sculpt Mode, if you move your mouse cursor in the 3D Viewport, you should notice that a red circle that follows your cursor along the terrain’s surface. 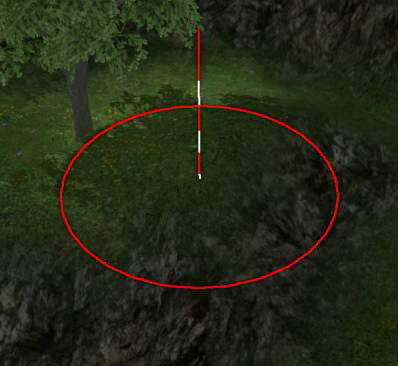 This red circle is your terrain brush. With the terrain brush, you can see exactly where you’re sculpting on your map. The circle of the brush also defines the radius of influence that your brush has. You can increase and decrease the radius by using the scroll wheel on your mouse. Alternatively, you can also adjust the radius from the Brush section of the Terrain Editing panel. Left mouse button (LMB): Click and drag with the LMB to add to the surface of your terrain, effectively lifting it up. Middle mouse button (MMB): Clicking and dragging the MMB smooths the surface. You can usually access the MMB by pressing down on your mouse’s scroll wheel. Right mouse button (RMB): The RMB subtracts from the terrain’s surface, as if you were digging a hole or a trench in the ground. Terrain: Using this drop-down list, you can pick the specific terrain object you want to edit if your map has more than one. Radius: This setting controls the influence area of your brush. Opacity: When sculpting, the opacity is multiplied by the value setting. Hardness: With this setting, you can control your brush’s fall-off, or how abruptly the brush’s influence area affects your terrain. Low values are gentler and merge more smoothly. High values give sharper edges. Value: Think of value as your brush’s strength. Crank it up and you can have a mountain in seconds. Keep it low and you can make subtler, detailed changes. Round brush: The round brush works best for organic areas. Square brush: The square brush is more suitable for adjusting terrain around man-made objects, like buildings.